Webster University took part as a sponsor of the Phi Theta Kappa Missouri Regional Convention in Branson, Missouri, March 23 and 24. This year’s event kicked off with Chrissy Gilbert, associate director of Transfer Admissions, welcoming Phi Theta Kappa students and advisors from across the Missouri Region. Gilbert, along with Transfer Admissions representative Stacey Tunnicliff were present at the sponsorship table throughout the Convention to support the Phi Theta Kappa honor society and promote the University to prospective students. In April, the Transfer Admissions team will be traveling to Kansas City as Webster University sponsors the Phi Theta Kappa Catalyst International Convention. This event will host approximately 6,000 community college students and advisors from across the United States and the world as they come together to celebrate Phi Theta Kappa’s centennial year. This spring, for the second year in a row Webster was honored in the Phi Theta Kappa Honor Society Transfer Honor Roll for its work in helping students transfer from community colleges into baccalaureate programs. Webster University was a sponsor of the 2018 Phi Theta Kappa Missouri Regional Convention. 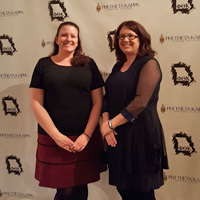 Phi Theta Kappa is the world’s largest and most prestigious honor society for two-year college students, established first at Stephens College in Missouri in 1910 as Kappa Phi Omicron. In 1918, the society was renamed Phi Theta Kappa, became nationally organized, and this year the society is celebrating its 100th birthday.